Learn all aspects of the Roulette game: general rules, how to place inside and outside bets, chips denomination, minimum and maximum bets. The best part of sitting at a roulette table, is that there just aren’t that many gawkers, peaking from behind the players’ scolder (like in craps for example). The player has all the time, focus and control to play at his own leisure. The best place to place yourself and be able to reach everything, would be near the centre or next to the dealer. If neither spot is available, then take what you can get. Once you have taken your seat, you are free to buy one or more stacks of 20 chips; each holding the table’s minimum bet as their value. Each player will be given chips of different colours, as to avoid any confusion when the action gets intense. Players are welcome to buy chips at any price they wish; this way they will increase the value of each individual chip in their stack, depending on how much the whole stack is worth. The dealer will then place a marker called lammer on the rim of the wheel; which acts as a reminder that a player has chips that are of higher value. You can pay for your chips using physical money, or checks (chips that have their respective denominations printed on them). Please note that chips purchased from the roulette table, only work at the roulette table. Because they don’t have any indications as what they are actually worth, players are especially forbidden to remove and take any chips that don’t have a denomination printed on them. You can exchange roulette chips for casino checks once the game is over. Playing with checks and actual money is not that unheard of actually. If a player steps up to the roulette table, offering regular casino chips as bets, the dealer might let him play. The problem arises when another player decides he want to do the same. In this case, the dealer might ask one, or even both players to purchase roulette chips (as to prevent people from arguing over whose chip is the winner, etc). Now that we know the different kinds of roulette wheels, the table layout and how to purchase chips, we are finally ready to place a bet. Players can choose to bet on a single number, two or more numbers; a combination of numbers; or even on half the numbers at the same. You can in fact bet on every single number, including the house numbers, should you wish to do so (not really advisable). When a player chooses to place more than one chip on a number (numbers), he is to do so by single stacking the chips vertically on top of the desired space (we will discuss exactly how the different bets are positioned throughout the layout in just a few moments). Don’t worry if someone else had already put their chips on top your number, you are free to stack your chips of top of theirs. When placing bets, don’t forget to wait for the dealer to finish removing the winner marker from the table. If you don’t follow this instruction, you might get reminded (and eventually scolded at) by the dealer. Bets are categorized in two major groups, inside and outside bets; depending on their position on the layout. All bets that are placed in the grid structure of the layout (i.e. on a number/numbers or on the grid itself) are referred to as inside bets. Bets that are placed outside the layout grid structure; like if a player was to bet on the ‘odd’ or ‘even’ section of the layout, are called outside bets. Inside bets have an advantage over outside bets in that that they generally pay more (winning a single number bet on a double-zero wheel, will payout 35 to 1), but are much less likely to come up (only 2.63%). The difference between a two number split bet and two single-number straight bets, lies in the displacement of the chip. When a player wishes to make a split bet, he must place his chip (or stack of chips), between the line of two adjacent (touching) numbers. Split bets save both time (and chips, should you be running low), by killing two rabbits with one stone, so to speak. The odds of winning a split bet are the same as hitting any single number, but doubled obviously (2.63% 2X= 5.26%). This means that placing two straight, or one split bet, makes no difference whatsoever; both in regards to the odds and the payout. *This rule of adding up the odds by one unit as number themselves get progressively bigger, applies to all other combinations of bets in the game; both inside and outside respectively. By placing a chip on the side on one of the twelve, three number rows (See fig; picture, etc + position 1,2,3…A,B,C), a player had just made what is known as a street bet. Upon a lucky spin, the player will be compensated 11 to 1; thus we can say that the player also has 1 in 11 chance of winning. As usual, when placing your chips on the roulette layout, be careful not to step on the lines of the two bordering rows. A square bet is made by placing a chip in the middle of four neighbouring numbers. The bet is made precisely on the cross intersection; basically displacing the chip equally between the four numbers. Reference the layout (fig, position) to see all the various number combinations that can be played on a square bet. The payoff here is 8 to 1. Only found in double-wheel roulette games, the five number ‘sucker’ bet is a combination of the first five numbers that are on the very top of the standard American layout. The chips is put on the left side, of where the numbers 1 and 0 meet (see position X). The numbers themselves are 0, 00, 1, 2, 3; which is the reason why this bet is called a sucker bet. Because there are 2 house numbers that go into the equation, the house edge in this situation would be 7.90% (instead of the usual 5.26% on double-zero wheels), which in turn pays only 6 to 1. This bet can be described as being similar to the ‘split’, but instead of putting one chip (or stack of chips) on two neighbouring numbers; we will place the chip on the left border side intersection of two neighbouring rows/streets (see fig X). The payoff on a double street bet is 5 to 1. Don’t be confused when looking for these combinations on the roulette wheel. The relationship between the numbers on the layout and the numbers on the wheel will be discussed in later chapters. When we look at the standard roulette layout, we can see betting areas that are outside the numbers grid, and have no discernible denomination. Outside bets have no relation to the numbers themselves; rather to their characteristics and displacement on the layout. A player can thus wager whether the numbers is going to turn up red or black, odd or even, high or low; and the position/displacement of the number, according to where that number is on the layout. There are 3 dozens of 12 numbers that make up the 36 number layout. You can find them by looking for the markings “1st 12”, “2nd 12” and “3rd 12”. The first dozen are the numbers between 1 and 12. The second dozen captures the numbers between 13 and 24. And the third dozen features the remainder, 25 through 36. The house numbers are not included in this bet. Landing on 0 or 00, will result in immediate loss. Twelve number bets payoff 2 to 1. Dozens are not the only 12 number bets in the game. Numbers can also be grouped vertically, as columns. Such a bet is referred to as a column bet, and it features the numbers of any of the 3 vertical columns that make up the layout. Looking at (fig X) we see the the 2 to 1 squares on the bottom of each column. The chip is placed inside the “2 to 1” square, which also indicated how much the house pays upon a successful landing. This is the first time we are going to talk about even number bets. 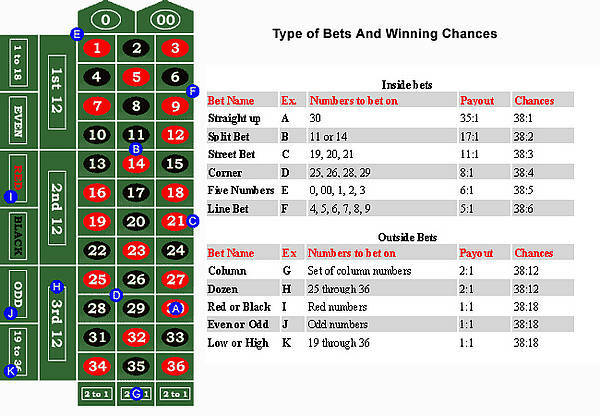 An even number bet, is where you pick half of the numbers featured on the layout, according to a number of variables. Choosing whether the winning number is going to be red or black is the perfect example of an even bet. Because there are 18 numbers that are black, and 18 numbers that are red, the odds of winning either are almost 50% (not including the house edge). As we can see (fig X), there two red and black diamonds on the left side of the layout. Please note that the house numbers are neither red or black, but green. Landing on either of them will result in a loss. The payoff on a 50/50 will be 1:1. You will see two boxes on either side of the coloured diamonds (fig X), marked “odd” and “even”. Place your chip (or stack of chips) on one, whether you choose one of the 18 odd, or one of the 18 even numbers on the standard layout. Again, landing on zero or double-zero (even when they are technically even numbers) will result in a loss. The payoff once again is 1:1. The ‘low’ betting section can be found at the very top left corner of the standard American layout. The bet features the numbers between 1 and 18, just as they are arranged on the table. The high number betting section (the numbers that run from 19 to 36) can be found at the bottom left corner of the standard American layout. Like all even bets, the house wins upon landing on 0 or 00, and as usually, the compensation upon a successful spin is 1:1. Regardless of where you play the game, there is bound to be sing showing the ‘minimum and maximum’ betting limits for each individual bet. 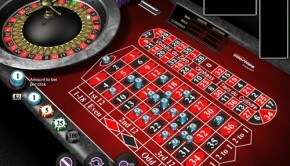 Even though some tables make it rather hard to find these indications, there cannot be a roulette table without them. The sign can read (MINIMUM OR OUTSIDE BET $5) OR (MAXIMUM OUTSIDE BETS $1000). There also might be some indication as to chip denominations and a bet limit system called “any way to a number”. It is important to check for these, especially if you are using a strategy. Staying within these limitations is obligatory for all players, and it is perhaps the most crucial component when playing roulette. As we discussed earlier, a player must purchase special roulette chips from the dealer before placing a bet. 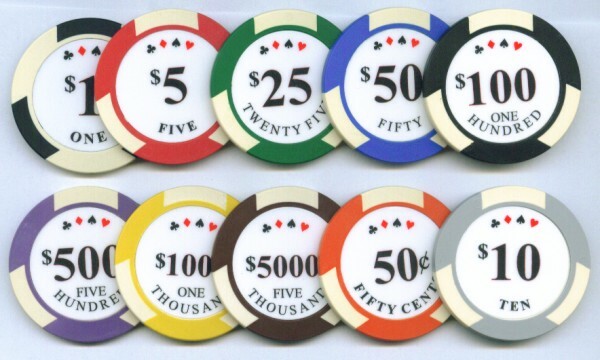 The chips usually come in stacks of 20; each chip holding a specific, predetermined value. Most casinos will offer small chip denominations (50 cent to a dollar); other might go even higher. If each chips is worth $1, then one, twenty-chip stack would add up to $20 total. If a player wishes to increase the value of each individual chip, he must pay the dealer the corresponding difference, and the dealer will place a special market called a lammer on the rim of the roulette wheel (to remind himself that not all chips are of the same value). Even though the table minimum for both inside and outside bets is pretty much identical, they are nevertheless treated as two different entities. Table minimums usually vary between $5 and $50, depending on where you play, but for the sake of this guide we will assume that all table minimums are $5 and each chip is worth exactly $1. The reason why inside and outside bets are treated differently, is because the rules state that a player must place the entire minimum bet when making an even number wager. This means that a player betting on red, must place 5 chips ($5) on red, and not on anything else. If the player wishes to play another outside bet, he must forfeit 5 more additional chips. This rule doesn’t apply for inside bets; where you can spread all 5 chips among the various numbers and be able to play (as long as you meet the table minimum that is). A player can make both inside and outside bets at the same time, but meet both minimum bet requirements first. The maximum amount of money you can place on a single bet (not a single spin) can range anywhere $500 to $10 000. This means that you can put a maximum bet on black to win, and you can put a maximum bet on odd to win; the two don;t relate to each other. Because inside bets pay so much better than outside bets, it makes sense that the betting limits would be severely lowered. The average inside betting limit is around $400-500, although some casinos might go as high as $1000 (winning a straight bet on $1000 will pay $35 000 + the $1000 you had to put in). The rule usually written as “maximum inside bet: $200 any way to the number”, refers to the maximum betting limit for each individual number. This means that you can only put $200 on any straight number, regardless of whether the number appears in any bigger combination. This means that on a $200 maximum per number, you can bet $200 on a straight bet, $400 on a split bet and $800 on a corner bet. It has come to the attention of gamblers world-wide, that some smaller casinos have been placing “maximum payout” signs on their roulette tables. This text could be found where the ‘maximum inside bet’ indication is supposed to be. This is done by more ‘cheaper’ casinos in order to fool the gullible out of their winnings. The ‘maximum payout’ limit (let’s say $2000) basically states, that a player is free to bet all the money he wants; but should he win and actually go over the maximum payout limit, the casino will only pay the aforementioned sum and not a cent more! This rule doesn’t affect the average betting enthusiast; but high rollers should keep this one in mind, just in case. We can all agree that winning big stacks of cash is what the game of roulette is all about. Simply place a small $10 bet on any number on the table, and should you be lucky enough to stop the ball on that exact same number, and at the odds of 1/35 the house will have to pay you $3500, (and if that is not a good deal…). You still get to keep your original $10 chips, regardless of the number/combination chosen. The list below table shows the odds and payouts of every single bet in the same, both inside and outside, as seen in (picture, figure). Twelve Number Bet (Column/Dozen) pays 2 to 1, at a probability of 31.58%. *Note that all odds are in accordance with the American double-zero wheel. Almost every roulette table in the world will come equipped with a stack of cards/pamphlets, stating all payouts, so you don’t have to memorize them from here. If you are playing in a big, well known casino in Downtown Las Vegas, you can be almost certain that they dealer won’t make a mistake when tallying up your winnings. This doesn’t apply for smaller, out-of-sight casinos, where human error (both unintentional and otherwise) can sometimes be an issue. The house edge is the same for all bets (5.26%), except for the five number (sucker) bet, where it is considerably larger (7.89%). Not all roulette games are played using the layout. Most roulette players in Europe would rather use the ‘announced bet’ calling system; where the player doesn’t place his bet according to inside/outside, red/black etc. markings on the layout, but rather the sequence of numbers on the wheel itself. When a player makes a straight bet, he can also call “…and the neighbours”, giving him a total of 5 straight bets. For further clarification, let’s say that the player wants to bet some chips on number 7 to come up. Should he request the ‘neighbours’, 4 more straight bets will be made from the 2 adjacent numbers on each side of the original number. Because announced bets are more common in Europe, we will go with the French number sequence; in which case betting on 7 and the neighbours, would include 18, 29 on one side, and 28 and 12 on the other. 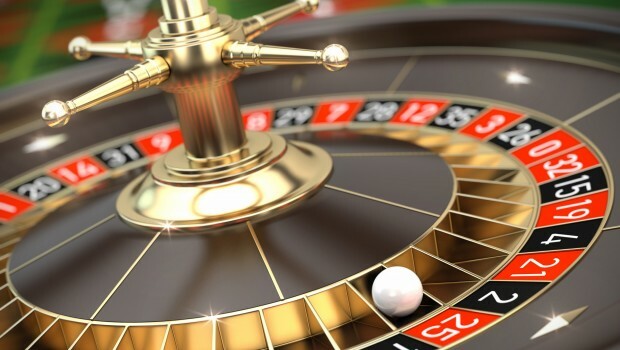 The player doesn’t need to know where each individual number is located on the roulette wheel; as long as he says number X and the neighbours, the dealer will make the appropriate bet for him. The house pays as with any straight bet – 35 to 1. To draw the attention of the crowds, and to make the game more favourable for the serious gambler, some casinos have implemented some very interesting rules in regards to protecting all even money bets, should the ball land on 0 or 00. *Note that neither of following special rules apply to bets, that don’t pay even money like a dozen or a column bet (even bets are red/black, odd/even, high/low). The rule ‘en prison’ only applies for French wheels; which are typically found throughout the European casino scene. When the ball lands on a zero, a player who had placed an even bet (regardless of what kind) has the chance of winning it back; instead of losing it like he normally should had. The house will keep (imprison) the bet and let the ball spin one more time. If this time the balls lands on the lucky number, the house will pay the bet back (but not the winnings). This means that if a player puts a $10 bet on red, and the bet becomes imprisoned; the best he can hope for it getting his original $10 bet back (no winnings can be expected). If the player loses the second time, his bet becomes property of the casino. Should the ball once again land on zero; different rules may apply in accordance to the casino’s personal policies. Either the bet is going to get imprisoned again (an event knowns as ‘double-imprisonment), or the player loses his wager altogether. Some casinos might even re-imprison the bet until something other than zero shows up on the wheel. En prison lowers the house edge on all even bets to 1.35% (from the usual 2.70% on single-zero wheels), giving the player an excellent chance to beat the odds. The le Partage rule is basically the same as en prison – the only major difference is that now, you don’t actually have to play a second time in order get some of your money back. As the ball lands on zero, every player with an even bet riding on the table, will be automatically compensated by ½ of his original wager. Sadly, players cannot ‘let it ride’; in hopes of getting all of their lost chips back, instead of just half.